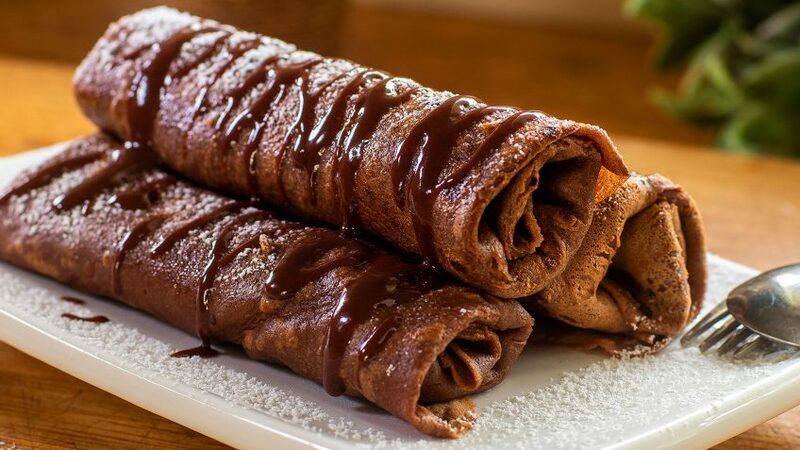 A chocolate eclair is a French pastry that contains a chocolate custard filling encased in a pastry shell, topped with chocolate icing (frosting). 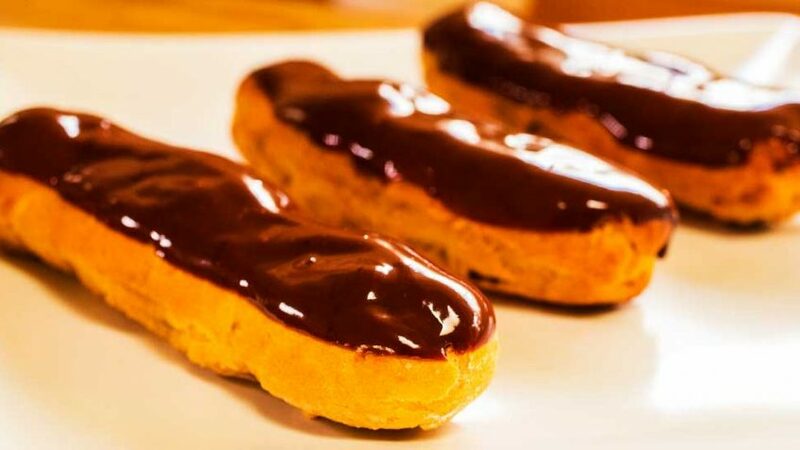 For chocolate eclairs, there are three main steps, the choux pastry, the pastry cream and the chocolate ganache. It sounds a lot but it’s really not that difficult. They are all quite quick to make, the most challenging being the choux pastry, but so worth it once you see how they puff, smell and taste. 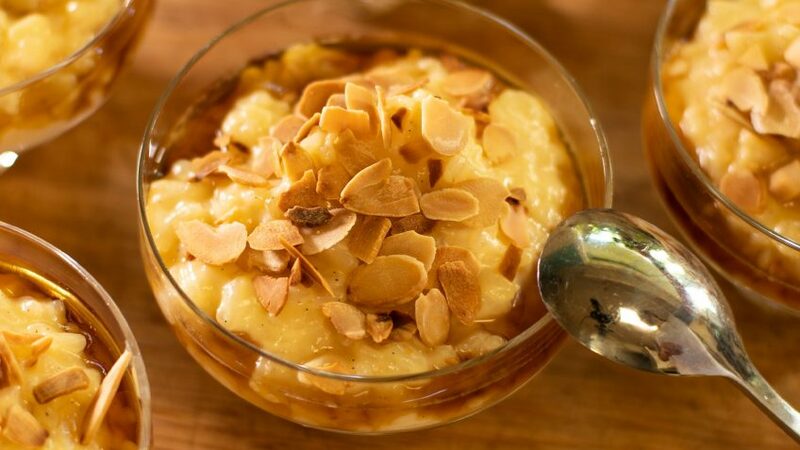 See my other recipes (choux pastry and pastry cream) to make this recipe. Links are provided below. 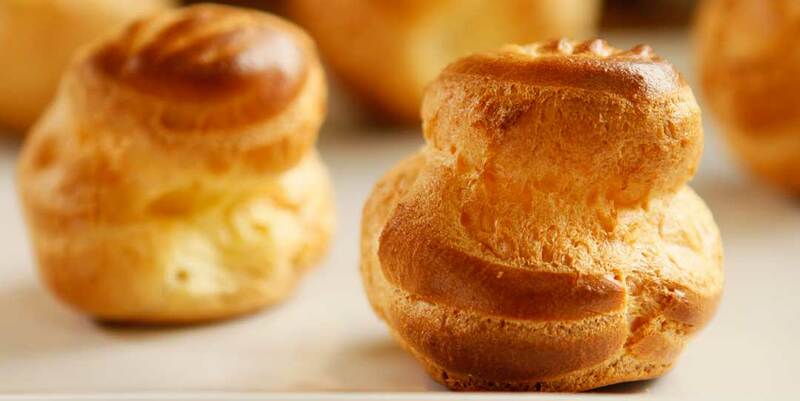 You will need “Choux pastry” see my recipe. Once made, leave to cool a little so it’s easier to use, but not cold. Place a baking sheet pan over a wet cloth to avoid movement. Insert a (1cm – approx half inch) nozzle attachment, into a strong piping bag. Fold back the piping bag over your hand, and hold it in one hand. Using the other hand with a large spoon, scoop out the choux mixture and insert deeply into the bag. Clamp the bag using your hand as you slide out the spoon or spatula. Do not over fill so you have enough room to twist the bag. Once twisted, hold with one hand, guide with the other and place a small blob on each corner of a baking sheet pan. This will be for gluing your parchment paper (if using silicon mat, skip this step). Line the parchment paper on the sheet pan and press firmly in each corner. This will avoid the paper slipping as you pipe mixture. Pipe mixture by creating strips of approx 5 inches (12 cm) in length give or take. But try and keep them uniform. on a standard half sheet tray, you should be able to pipe 10 eclairs. Keep enough space in between as they will triple in size. Dip your clean finger into some plain water and flatten and reshape the ends of the eclairs. Dust lightly with some icing (powdered) sugar. This will reduce cracking. If you prefer a more rustic style, avoid this step. Place in oven and bake for 30 minutes at 375°F – 190°C. After the first 15 minutes, place a fork to slightly leave a gap in your oven door. This will release some steam (never fully open door or they will collapse) Leave to dry out the remaining 15 minutes. 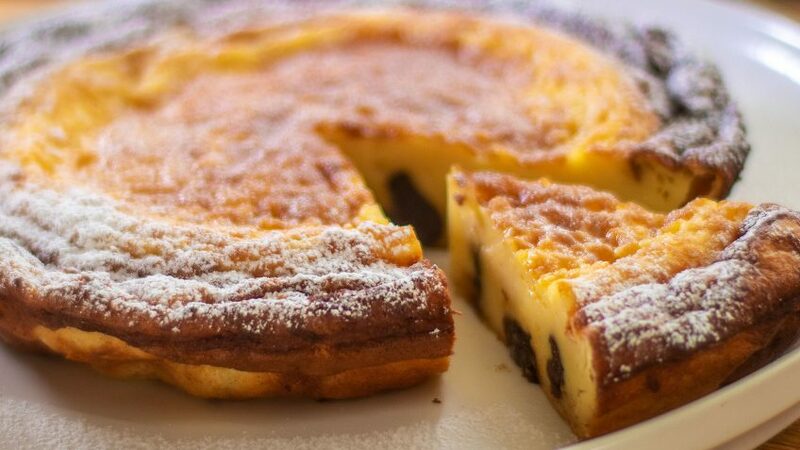 See may pastry cream recipe. Once the cream is made, add the cooking chocolate along with the cacao into the hot cream. 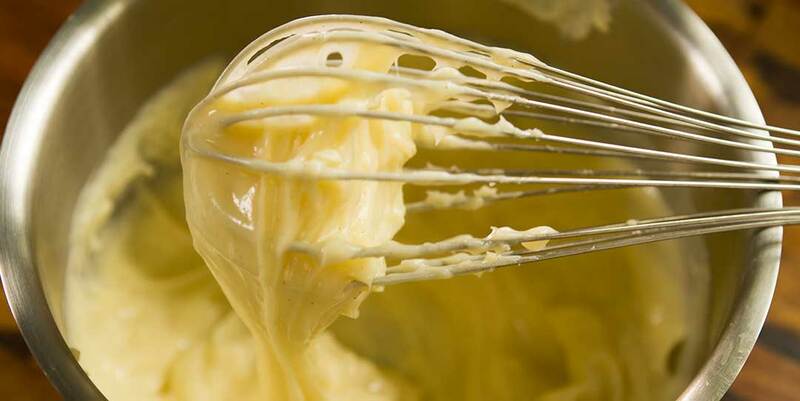 If the cream was made in advance, reheat it in a saucepan over a slow burner as you whisk until hot. Whisk well until chocolate has fully melted. Leave to cool until warm. Using the tip of a small pointy knife, pierce a hole on the bottom of each end of the pastry casing. If the casings are longer you may need 3 holes. 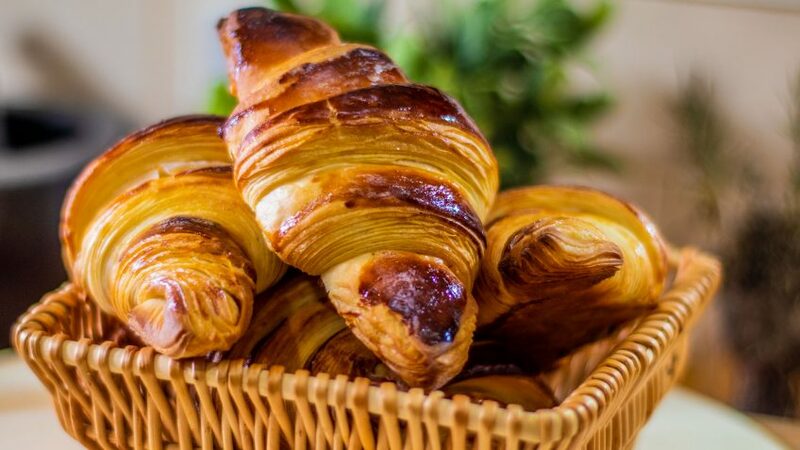 Using a small tip piping nozzle, place the chocolate pastry cream into a strong piping bag (note: a lot of cheap plastic ones will tear) fill the bag with the pastry cream. Fill the casings by inserting the bag in each hole and squeezing until the eclair is full. You will feel the weight. For the icing (frosting) you can use chocolate fondant (traditional) but for simplicity I’m using a basic chocolate ganache. In a sauce pan add the cream and a cup of dark cooking chocolate. 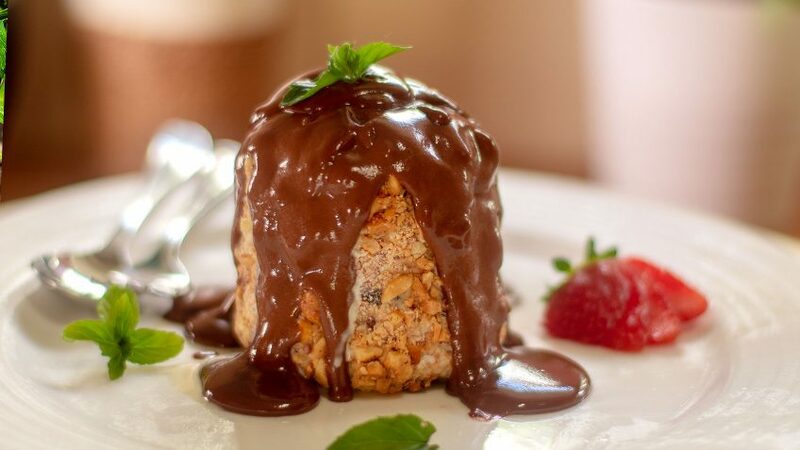 Place over low to medium heat and mix using a wooden spoon until chocolate has melted. While the mixture is hot, pickup the filled eclairs and dip the tops by lowering them flat into the chocolate ganache. Let any excess drip off. The eclairs will keep for two days with pastry cream filling. Don't let the mixture get too cold before piping. You can freeze the empty pastry cases for later use, try not to squash them so they don't lose their shapes. You can also substitute powdered sugar with eggwash or melted butter to give them a smoother finish. Scoring them lightly with a fork will provide a more uniform rise, otherwise a rustic puff looks great too.